Volcanic eruptions create volcanic ash clouds containing an abrasive dust that poses a serious safety threat to flight operations. Adding to the danger is the fact that these ash clouds are not easily discernible from ordinary clouds when encountered at some distance from the volcanic eruption. When an aircraft enters a volcanic ash cloud, dust particles and smoke may become evident in the cabin, often along with the odor of an electrical fire. Inside the volcanic ash cloud, the aircraft may also experience lightning and St. Elmo’s fire on the windscreen. The abrasive nature of the volcanic ash can pit the windscreens, thus reducing or eliminating forward visibility. The pitot-static system may become clogged, causing instrument failure. Severe engine damage is probable in both piston and jet-powered aircraft. Every effort must be made to avoid volcanic ash. Since volcanic ash clouds are carried by the wind, pilots should plan their flights to remain upwind of the ash-producing volcano. Visual detection and airborne radar are not considered a reliable means of avoiding volcanic ash clouds. Pilots witnessing volcanic eruptions or encountering volcanic ash should immediately pass this information along in the form of a pilot report. The National Weather Service (NWS) monitors volcanic eruptions and estimates ash trajectories. This information is passed along to pilots in the form of SIGMETs. As for many other hazards to flight, the best source of volcanic information comes from PIREPs. Pilots who witness a volcanic eruption or encounter volcanic ash in flight should immediately inform the nearest agency. Volcanic Ash Forecast Transport and Dispersion (VAFTAD) charts are also available; these depict volcanic ash cloud locations in the atmosphere following an eruption and also forecast dispersion of the ash concentrations over 6- and 12-hour time intervals. See AC 00-45, Aviation Weather Services. Figure 10-16. A thunderstorm packs just about every weather hazard known to aviation into one vicious bundle. There is no useful correlation between the external visual appearance of thunderstorms and the severity or amount of turbulence or hail within them. All thunderstorms should be considered hazardous, and thunderstorms with tops above 35,000 feet should be considered extremely hazardous. Weather radar, airborne or ground based, normally reflects the areas of moderate to heavy precipitation (radar does not detect turbulence). The frequency and severity of turbulence generally increases with the radar reflectivity closely associated with the areas of highest liquid water content of the storm. A flightpath through an area of strong or very strong radar echoes separated by 20 to 30 miles or less may not be considered free of severe turbulence. 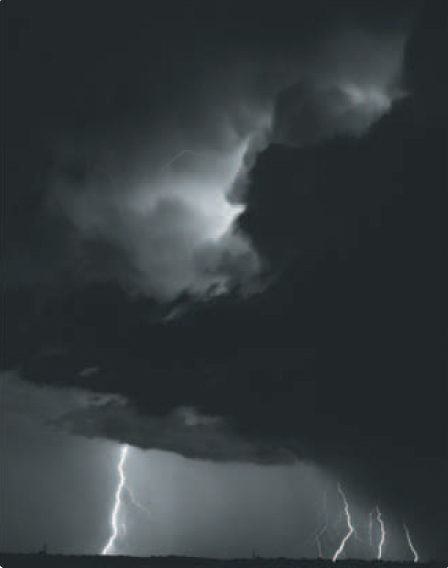 The probability of lightning strikes occurring to aircraft is greatest when operating at altitudes where temperatures are between –5 ° C and +5 ° C. In addition, an aircraft flying in the clear air near a thunderstorm is also susceptible to lightning strikes. Thunderstorm avoidance is always the best policy. Wind shear can be defined as a change in wind speed and/or wind direction in a short distance. It can exist in a horizontal or vertical direction and occasionally in both. Wind shear can occur at all levels of the atmosphere but is of greatest concern during takeoffs and landings. It is typically associated with thunderstorms and low-level temperature inversions; however, the jet stream and weather fronts are also sources of wind shear. As Figure 10-17 illustrates, while an aircraft is on an instrument approach, a shear from a tailwind to a headwind causes the airspeed to increase and the nose to pitch up with a corresponding balloon above the glidepath. A shear from a headwind to a tailwind has the opposite effect, and the aircraft will sink below the glidepath. A headwind shear followed by a tailwind/downdraft shear is particularly dangerous because the pilot has reduced power and lowered the nose in response to the headwind shear. This leaves the aircraft in a nose-low, power-low configuration when the tailwind shear occurs, which makes recovery more difficult, particularly near the ground. This type of wind shear scenario is likely while making an approach in the face of an oncoming thunderstorm. Pilots should be alert for indications of wind shear early in the approach phase and be ready to initiate a missed approach at the first indication. It may be impossible to recover from a wind shear encounter at low altitude. In plain language, the controller is advising aircraft arriving on runway 27 that at about 3 miles out they can expect a wind shear condition that will decrease their airspeed by 20 knots and possibly encounter turbulence. Additionally, the airport surface winds for landing runway 27 are reported as 200° at 15 knots. Pilots encountering wind shear are encouraged to pass along pilot reports. Refer to AIM for additional information on wind shear PIREPs. Pilots on IFR flight plans operating in VFR weather conditions may request VFR-on-top in lieu of an assigned altitude. This permits them to select an altitude or flight level of their choice (subject to any ATC restrictions). Pilots desiring to climb through a cloud, haze, smoke, or other meteorological formation and then either cancel their IFR flight plan or operate VFR-on-top may request a climb to VFR-on-top. The ATC authorization contains a top report (or a statement that no top report is available) and a request to report upon reaching VFR-on-top. Additionally, the ATC authorization may contain a clearance limit, routing, and an alternative clearance if VFR-on-top is not reached by a specified altitude. Fly at the appropriate VFR altitude as prescribed in 14 CFR part 91. Comply with the VFR visibility and distance-fromcloud criteria in 14 CFR part 91. Comply with IFR applicable to this flight (minimum IFR altitudes, position reporting, radio communications, course to be flown, adherence to ATC clearance, etc.). Pilots operating on a VFR-on-top clearance should advise ATC before any altitude change to ensure the exchange of accurate traffic information. ATC authorization to “maintain VFR-on-top” is not intended to restrict pilots to operating only above an obscuring meteorological formation (layer). Rather, it permits operation above, below, between layers, or in areas where there is no meteorological obstruction. It is imperative pilots understand, however, that clearance to operate “VFR-on-top/VFR conditions” does not imply cancellation of the IFR flight plan. Pilots operating VFR-on-top/VFR conditions may receive traffic information from ATC on other pertinent IFR or VFR aircraft. However, when operating in VFR weather conditions, it is the pilot’s responsibility to be vigilant to see and avoid other aircraft. This clearance must be requested by the pilot on an IFR flight plan. VFR-on-top is not permitted in certain areas, such as Class A airspace. Consequently, IFR flights operating VFRon- top must avoid such airspace. VFR over-the-top must not be confused with VFR-ontop. VFR-on-top is an IFR clearance that allows the pilot to fly VFR altitudes. VFR over-the-top is strictly a VFR operation in which the pilot maintains VFR cloud clearance requirements while operating on top of an undercast layer. This situation might occur when the departure airport and the destination airport are reporting clear conditions, but a low overcast layer is present in between. The pilot could conduct a VFR departure, fly over the top of the undercast in VFR conditions, then complete a VFR descent and landing at the destination. VFR cloud clearance requirements would be maintained at all times, and an IFR clearance would not be required for any part of the flight.